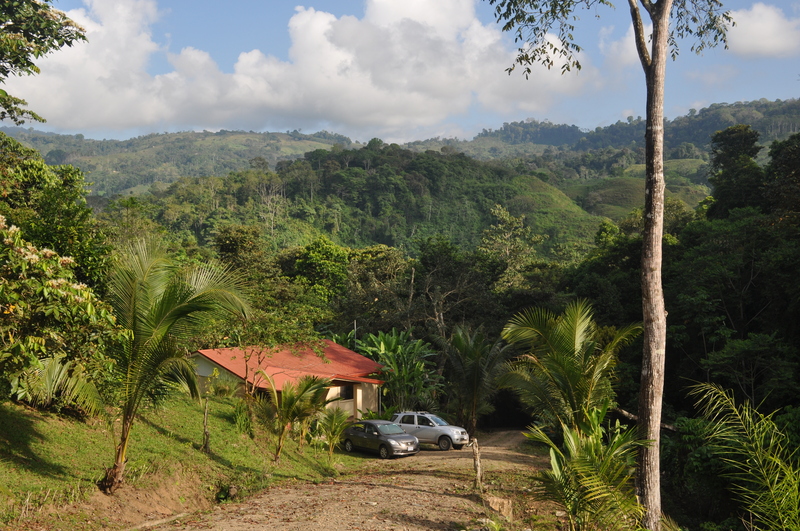 One of the reasons we chose Costa Rica as a warm vacation spot this year was that my fiancée’s aunt and uncle have a small house in the mountains where we could stay. Since money is a major influence on anything we decided to stay there (and they had space for us) for the week. Their house was a bit north of a town called Dominical on the southern Pacific coast which we learned quickly was not the biggest in terms of traditional Western amenities. One of the other things I missed in researching requirements for this trip (aside from reading rental agreement conditions) was the fact that most people rent 4 wheel drive vehicles in this region because the “roads” are not asphalt all the time and often have steep grades to them. Because we were staying in an isolated house in the mountains, this was even more so. As you can see from the photo below, the house is in the middle of a forest/jungle and the road going by is quite steep and rocky. Luckily for us our small Nissan Versa was capable of making the climbs and dips while driving between 20-40 kph for the 40 minutes required to get from “town” to the house. Since it was so out of the way we made sure to only do this once per day to reduce wasted time and unnecessary damage to the car. By the end of the week, the car was fine (we were a bit rattled) and we did not lose any money from our deposit (despite the car being caked in dust). Probably the main excitement of being in this region of Costa Rica is the lack of people around to bother you on your journey. Even while eating dinner or sitting on the beach in Dominical, there are few people around to bother you or make you feel overwhelmed. The “busy” beach probably had 40 people within earshot of you at all times. The other beaches we went to had even fewer. 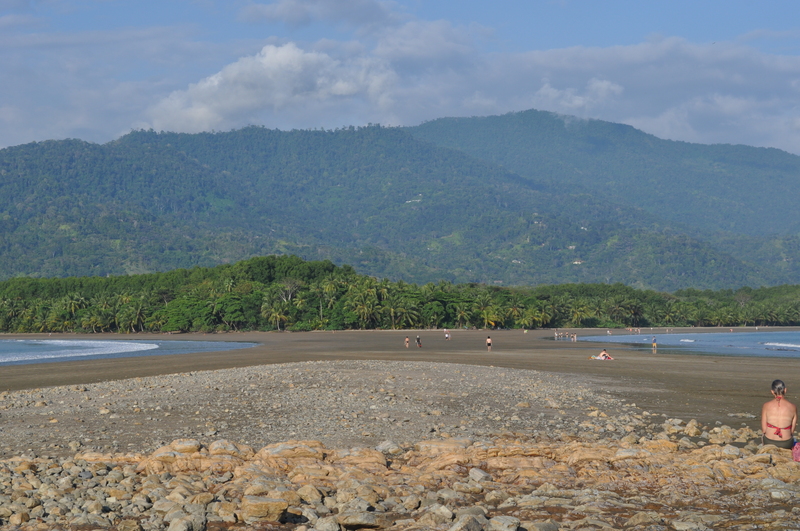 A sand bar between two beaches at Playa Ballena. Every day at high tide it gets covered and becomes not passable. 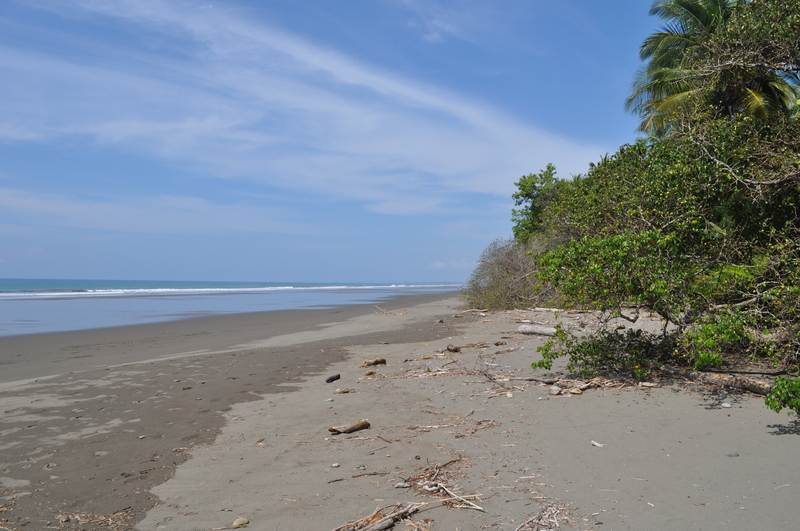 An unmarked beach south of Dominical. There were never more than 10 people that we could see and the beach went on for miles. While it was sometimes annoying because we could not just slip our of the house for dinner without thinking of the 40 minutes journey, it was also liberating not to have to think about all the things we could do because there were fewer options. We cooked and ate dinner outdoors; explored the jungle on small hikes (a beautiful waterfall was a 10 minute walk from the house); and we relaxed and read books for hours. It was a great experience to be so isolated!